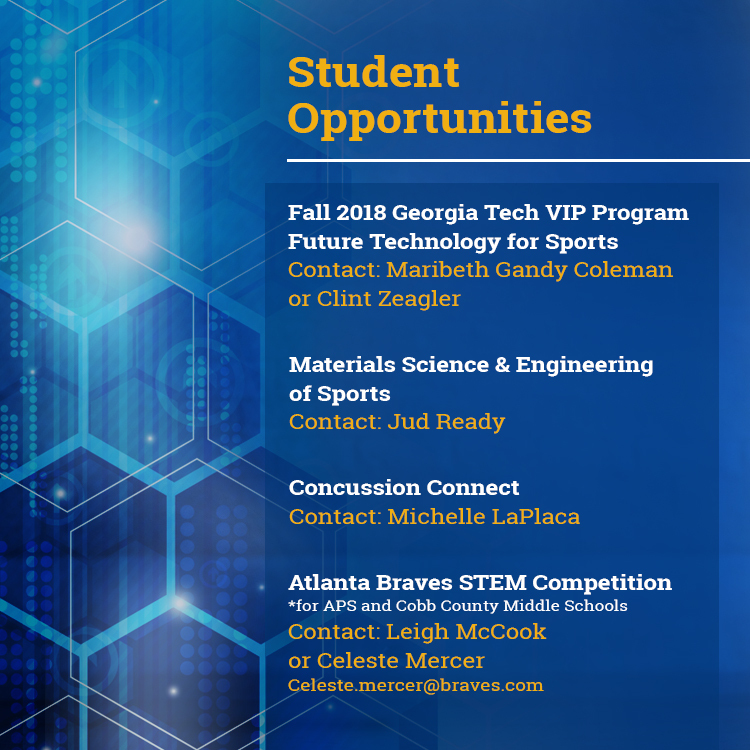 Georgia Tech academic and athletic units are working together to advance ideas that benefit athletes on and off the field. It’s a lofty goal, for sure, but Doug Allvine is determined to achieve it. As Georgia Tech’s assistant athletics director for innovation, it’s his job to bring together athletics, researchers, and industry. He’s been in the newly-created position for about a year and is concentrating on three areas—sports performance, fan experience, and operations. Allvine and the Georgia Tech Athletic Association are also spearheading the creation of the Center for Sports Innovation, which focuses on entrepreneurship innovation. The center is working with other units on campus, including the Institute for People and Technology, the College of Computing, and the Office of Industry Collaboration. It’s all about bridging the gap. “Georgia Tech is unique because we're situated in Atlanta and situated next to a vibrant and growing entrepreneurial ecosystem, and that's where the differential advantages for Georgia Tech athletics come from,” said Bill Cutts, senior director, Georgia Tech Office of Industry Collaboration. It’s the same idea that’s behind innovation neighborhoods like Tech Square in Midtown Atlanta that attract not only entrepreneurs but also large companies. Students and student-athletes are also critical to this strategy. “We want to give them opportunities to be involved in sports innovation, whether it’s from a testbed standpoint or a research standpoint and make them have a greater awareness of some of these ecosystems that we have in place, whether it’s Create-X or ATDC. There are so many different programs that we have here,” said Allvine. As a former student-athlete, and now a researcher, Omer Inan has unique insight into the physical challenges that athletes face and how technology can address them. The All-American collegiate discus thrower joined Georgia Tech in 2013 as an assistant professor in the School of Electrical and Computer Engineering (ECE). “I had this interest and passion for allowing people to get better information about their health and possibly their performance—from an athletic standpoint—outside of clinical and lab settings,” said Inan. He had an idea to use his background in audio engineering to develop a knee brace that measures the popping and cracking sounds inside joints. Sensors are attached to the skin, while two types of miniature microphones detect sound. One catches soundwaves in the air, and the other senses vibrations on the skin’s surface in response to acoustic energy inside the body. 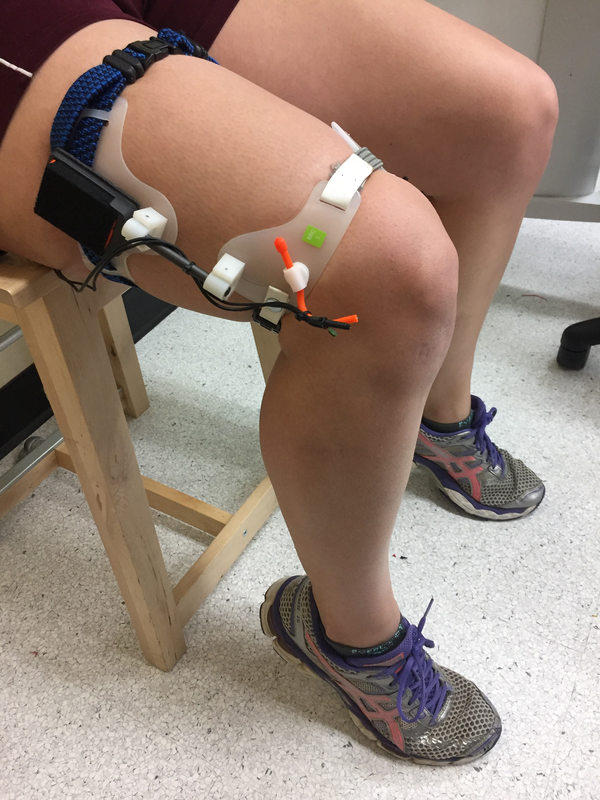 Thanks to funding from DARPA’S Warrior Web program to develop wearable technologies for soldier rehabilitation, and the Smart and Connected Health program from NSF and NIH, Inan along with collaborators in ECE and the College of Sciences are building better, less expensive microphones and sensors. They’re also examining what the sounds mean for determining if joints need further rehabilitation. “For example, if we inject saline into the knee capsule to mimic swelling, how does that impact the sounds?” explained Inan. His team is conducting cadaver studies, including performing small meniscal tears, which simulate one of the most common knee injuries in athletes. 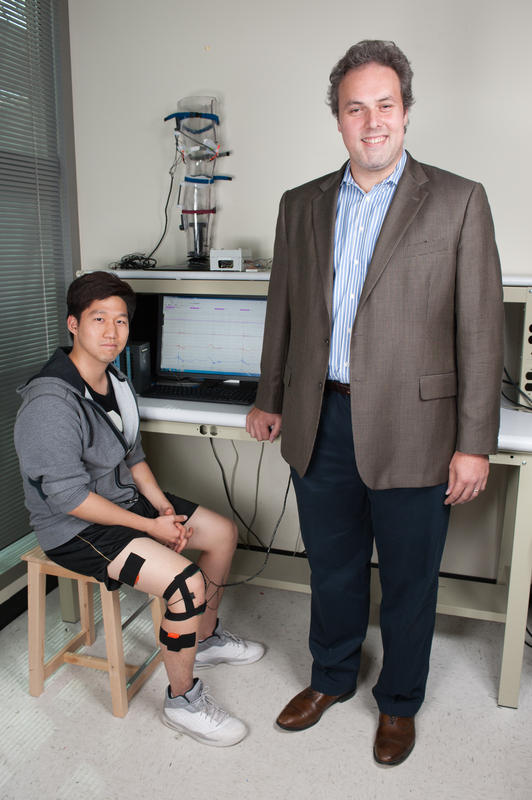 Inan recently expanded his research to study more complex joints—elbows and shoulders—and is working with the Georgia Tech baseball team to take measurements from pitchers and infielders throughout the season. His team is trying to determine markers of joint overuse that could be used to predict the risk of overuse injury. A bump or blow to the head that rattles the brain and disturbs normal function is known as traumatic brain injury, or TBI. It’s a complicated injury, with a wide range of symptoms from a headache to memory loss and even seizures. In athletics, from youth to professional, mild concussion is the most frequent type of traumatic brain injury. 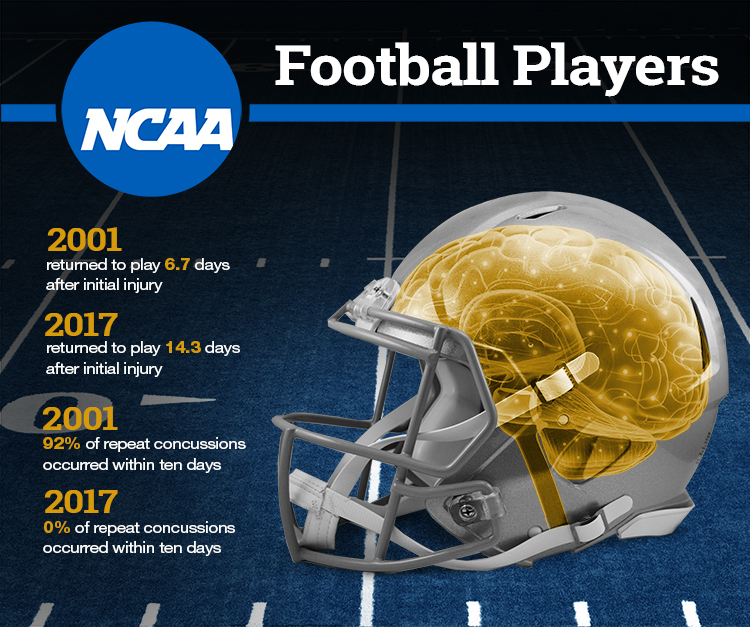 At the college level, the NCAA and the U.S. Department of Defense have embarked on the largest-ever study of concussion in sports with the goal of better understanding and preventing these injuries. Preliminary data from the CARE Consortium study, released in January, indicates that attitudes about concussion among student-athletes, medical providers, and athletic programs have changed over the past 17 years. Campuses are emphasizing adequate recovery time, which could result in fewer repeat concussions. In 2016, Georgia Tech President G.P. “Bud” Peterson became chair of the NCAA Board of Governors, the NCAA’s highest governing authority. Last April, the board increased its emphasis on the importance of safeguarding student-athlete health and safety by endorsing nine areas that the NCAA’s Sport Science Institute has identified as priorities, including concussion, cardiac health, and mental health. Dr. Peterson has invited the NCAA’s first chief medical officer, Dr. Brian Hainline, to visit Georgia Tech in the fall to explore collaborations between Georgia Tech, the Centers for Disease Control and Prevention, and Children’s Healthcare of Atlanta in the area of concussion research. Michelle LaPlaca, associate professor in Georgia Tech’s and Emory's Department of Biomedical Engineering, has been researching TBI for more than 20 years. She says whether the injury is mild or severe, it’s difficult to figure out what's going on in the brain and how that contributes to function. Researchers study TBI in several ways: at the cellular level by mechanically injuring cells and observing how they break down; they also use computer-generated simulations and animal models. There’s always one thing missing, though: how to connect all these levels of research to human TBI. “You can’t directly measure what happens in the brain of a human during a traumatic brain injury,” said LaPlaca. She calls TBI “a heterogeneous injury.” It manifests itself in different ways—memory problems in one person, a headache in another. Doctors consider underlying health issues, and gender, too. Then there’s the nature of the injury itself. Was the athlete hit from the front or the back? Were they wearing a helmet? LaPlaca examines all of these variables and how they contribute to the brain injury. She also says there’s a need for more tools that can quickly and objectively assess concussion. LaPlaca and David Wright of Emory University have developed DETECT or Display Enhanced Testing for Cognitive Impairment and Mild Traumatic Brain Injury. After a suspected concussion, an athlete puts on a head-mounted display and earphones, which reduces outside distraction and creates a more immersive test-taking experience. Using a controller, they take a shortened neuropsychological test measuring memory and reaction time, as well as balance and eye movement. By covering multiple neurological domains, DETECT can better guide clinical management of the concussion. The assessment results also take into account off-the-field factors like learning disabilities and medications. 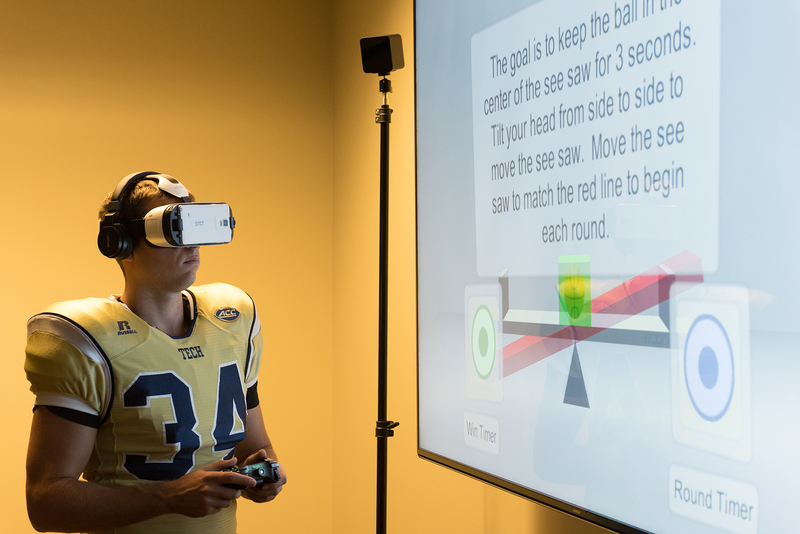 Georgia Tech researchers have tested DETECT with high school and college football players and find that it is accurate in distinguishing concussed players from those without a head injury. LaPlaca emphasizes, though, that DETECT is meant to enhance the knowledge and expertise of athletic trainers, not replace it. She says although academics and athletics don't typically work together, “there’s a lot of willingness on both sides” to work together to advance innovative ideas that benefit athletes on and off the field. Technology advancements are shaping the sports experience for fans.